Kid Klown in front of his house. 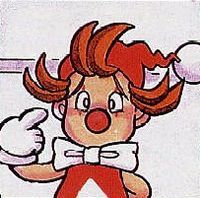 Kid Klown was the main character in a few 90's video games such as Kid Klown in Night Mayor World. He also appears briefly in the German Club Nintendo magazine comic "Warios Weihnachtsmärchen". In this story, Kid Klown visits Wario's bomb shop, looking for a "surprise bomb". Wario grabs Kirby, who is also in his shop, paints him black and delivers him to his client. Kid goes home contentedly, but soon realizes that it is Kirby who Wario claimed to be the surprise bomb. Both Kid and Kirby are very angry at Wario and can be seen playing darts with a target depicting Wario's face when Wario visits them with the Ghost of Present. By the end of the story, however, Wario gives some cookies to them as an apology, and Kid and Kirby can be seen enjoying them.